Media industry ad revenue declined 12% year-over-year to $125.3 billion in 2009, according to a report issued by Kantar Media, the WPP-owned research firm formerly known as TNS. The only major growth area: Online ad spending. 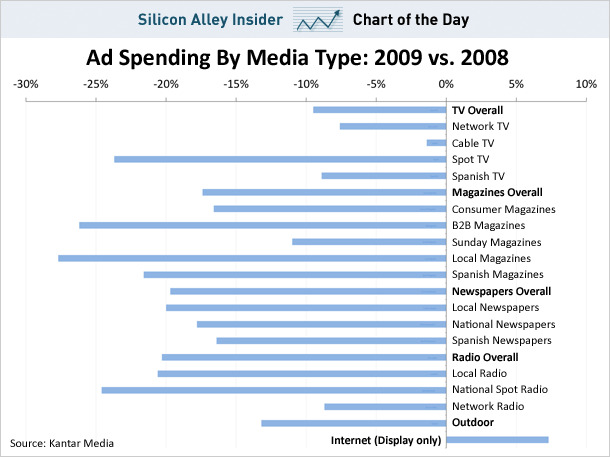 Internet ads — display only — increased 7% in 2009, according to the report. 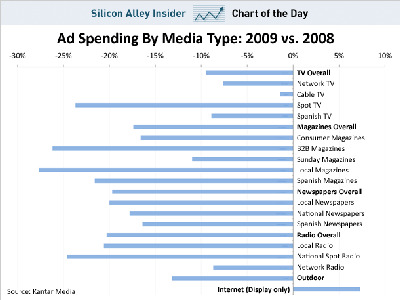 Meanwhile, TV ad spending fell 10%, as cable outperformed network TV, and spot spending fell dramatically, as political ads from 2008 weren’t around in 2009. Magazines dropped 17%, newspapers and radio each dropped 20%, and outdoor fell 13%.